Last year Argonne celebrated its 70th anniversary. Here’s what state-of-the-art science facilities looked like decades ago when Argonne was a fledgling laboratory—and what their descendants look like now. 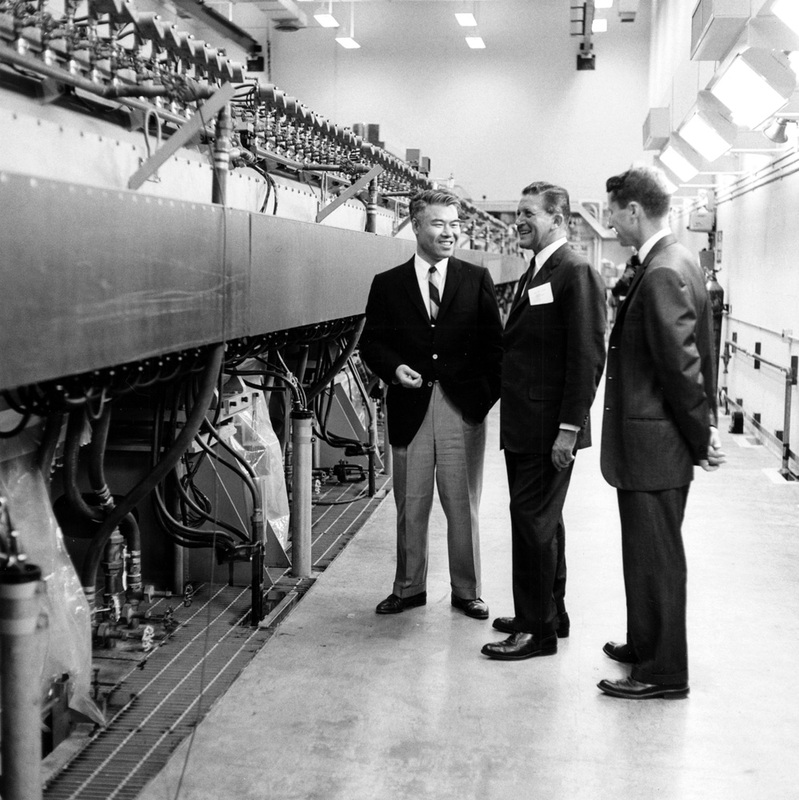 THEN (1963): Illinois governor Otto Kerner visits the Zero Gradient Synchrotron, which accelerated protons to 12.5 billion electron volts. From left: Lee C. Teng, Particle Accelerator division director, Governor Kerner, and Roger Hildebrand, associate laboratory director for High Energy Physics. Teng and Hildebrand are showing the governor the 110-foot linear accelerator. The ZGS accelerated protons to 12.5 GeV (or 12.5 billion electron volts) in a 200-foot ring. When it began operation in 1963, it was the highest-energy weak-focusing proton synchrotron in the world. In 1970, a 12-foot bubble chamber was added for studying particle momentum, and the neutrino was observed in a hydrogen bubble chamber for the first time. Once thought to be massless, the neutrino is a tiny but abundant particle important to our understanding of the Standard Model of particle physics. Although neutrinos had been detected before, little was understood about their nature, and the ZGS was suited for further studying this elusive particle because its bubble chamber was the largest in the world, able to capture a neutrino interaction in a photograph of the bubble chamber after less than 3,000 pulses of the ZGS. Today, Argonne is part of the international ATLAS experiment located at the Large Hadron Collider, a 13-teraelectron-volt particle accelerator with beams 500 times more powerful, in terms of electronvolts alone, than the ZGS was 50 years ago. As accelerators have increased in power, physicists have discovered heavier particles and rarer particle interactions. 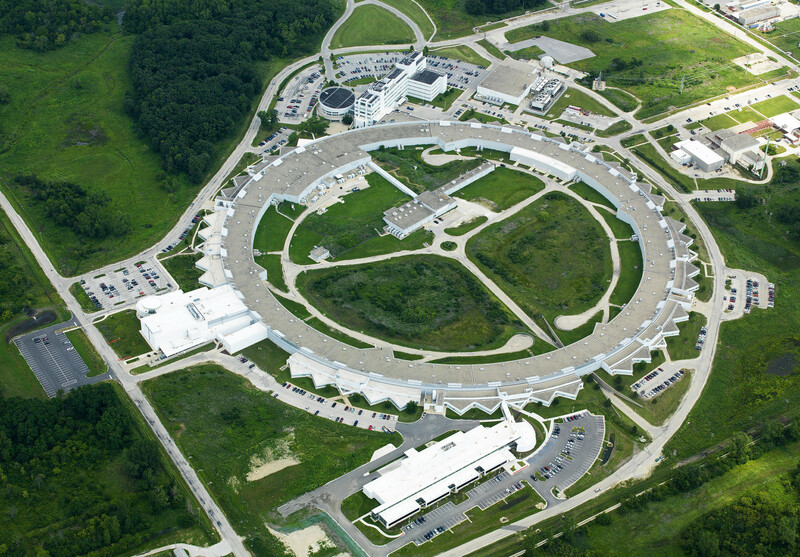 When the ZGS was retired in 1979, its synchrotron ring became the booster (an initial accelerator that ​“boosts” a particle’s energy before it enters the main ring) for Argonne’s next imaging venture: the IPNS, the world’s first pulsed neutron source. Similar to X-ray studies with photons, neutrons can probe the atomic structure of materials, but their lack of electrical charge allows them to penetrate some materials more deeply with less disruption to the material. Scientists had been producing neutrons for research through fission in experimental reactors, but those neutrons, delivered in steady streams, limited the range of what could be studied. IPNS leveraged accelerators to deliver short, intense pulses that added a new dimension to materials characterization. During the 26 years the IPNS was in operation, researchers used it to solve the structure of a high-temperature superconductor and identify the structure and formation of Alzheimer’s plaques, among many other discoveries. X-rays are powerful and versatile tools of scientific exploration: they can penetrate materials and provide detailed information on atomic and molecular structure and behavior. By manipulating electrons with magnets, the Advanced Photon Source produces radiation at different wavelengths across the electromagnetic spectrum, creating an incredibly high-powered ​“microscope” to study many kinds of materials—from proteins to metal alloys. Because of its versatility and large number of visiting researchers, the APS contributes to discoveries in fields from electronic and magnetic materials to the environmental and life sciences, among many others. In fact, two Nobel Prizes have arisen from APS research, including the 2009 Nobel Prize in Chemistry for the structure of the ribosome and the 2012 Nobel Prize in Chemistry for the structure of the human G-protein-coupled receptor. When the AVIDAC was installed in 1953, it was described as working ​“approximately 100,000 times as fast as a trained computer [a person] using a desktype electric calculating machine [a calculator].” The computer could add, subtract, multiply, divide, and perform other arithmetic operations for numbers up to 999,999,999,999. The growth in computer memory continues to be tremendous. The Mira supercomputer at Argonne today has over 700 terabytes of memory—1.5 trillion times that of AVIDAC. To make use of all this memory toward solving ever more complex problems, today’s supercomputers have different computing architectures capable of performing more operations much more quickly. Argonne’s first supercomputer, AVIDAC, could, in 20 minutes, complete work that would take two mathematicians three years to complete with electric calculators. At 10 quadrillion operations per second, it is a challenge to even compare Mira’s capability to what a mathematician could do with pen and paper. Rather, Mira can do in a day what it would take a modern-day personal computer 20 years to do. Mira is one of the most powerful computers in the world, and its architecture, or the way it solves problems, is highly suited to simulating physical processes (like protein folding, galaxy formation, ion solvation, and more) with great realism based on the fundamental laws of physics. APS-U: A planned upgrade to the Advanced Photon Source will transform the synchrotron into the ultimate 3-D X-ray microscope, creating the most technologically advanced hard X-ray light source the world has ever seen and transforming our ability to understand and manipulate matter at the nanoscale. It will increase the beam’s brightness by a hundredfold, to create highly penetrating X-rays more than 10 trillion times brighter than the X-rays used in routine medical imaging. AURORA: In 2018, supercomputing power at Argonne will take another leap with Aurora, a system that will be about 20 times more powerful than Mira. It will be able to resolve scientific problems, such as quantum mechanical processes, that are simply beyond our understanding without computer modeling and simulation—yet have very real scientific and engineering applications. THEN (1981): Scientists used the Intense Pulsed Neutron Source to probe the atomic structure of materials using neutrons. NOW: The Advanced Photon Source accelerates electrons to nearly the speed of light to make X-rays that can penetrate deeply into materials to help us understand them. THEN (1953): Argonne computer scientist pioneer Jean F. Hall operates the AVIDAC, a top-of-the-line supercomputer with a memory of about 5.1 kilobytes. NOW: Today, Argonne’s supercomputer Mira can crunch numbers at 10 quadrillion operations per second. This article is one of many in Argonne Now magazine, the laboratory’s science magazine which explores the cutting-edge discoveries happening all around us. Explore how Argonne scientists and engineers are working together to answer the biggest scientific questions facing humanity.